Wondering how to decorate your new home? A new home is a blank canvass waiting for you to bring your personal style to its walls, halls, floors, doors and windows. Painting is the best way to create a particular feeling in your new home, and it’s a must for places that were not painted by the previous owners. Necessary supplies: paint, primer, finish, rollers, paint brushes, roller pan, sandpaper, tape, newspaper. Remove any wallpaper, and sand/smooth rough spots on the wall. Use stain-blocking primer to coat any dark patches. Otherwise, they will show through your new paint job. Tape the edges of the walls you don’t intend to paint and cover the floor. Get and fan and some ventilation. Place one coat of primer, then two coats of paint, then finish. Wait for each coat to dry. Use a roller for large area. 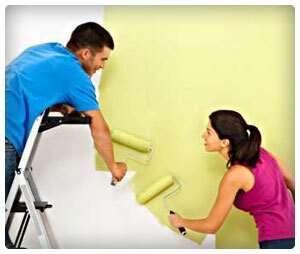 After dipping the roller in paint, apply the paint in a large “W” shape, which helps you distribute the paint evenly. Use a fine paint brush for corners and edges. It’s not what you have; it’s how you use it. Decide on a focal point for a room (TV, fireplace, painting, window, table), then build the room around it by arranging your furniture. If you want to have a more open feel, spread things out and have chairs and couches face open space. If you want a more intimate feeling, keep things closer and have them face each other. Something beyond the basic couch-facing-TV set up might be very refreshing for your visitors. Above all, try to create a unique feeling for the room by taking advantage of what your house has to offer. If you have a large window, make sure people can look out of it. If you have a fireplace, make sure you can use it. If your kitchen has a bar, don’t use it to stock napkins. Sometimes one well-placed piece of flair can really pull a room together. Plants – Plants are a great way to make a room feel lively and fresh. Sometimes a small plant will do; other times a larger, more dominant plant might be better. Artwork – Artwork, whether a sculpture, painting, photograph or even a drawing, can give a room a particular feeling and/or an interesting focal point. Art is highly subjective. Go for what you like and what you think fits well in your home. Drapes, rugs, pillows and blankets – These can all provide comfort to your home while also adding color and design. The Patio, Lawn and Sidewalk. Don’t forget that the first thing people will see is your front yard leading up to your door. Plant and prune – Keep your grass mowed, plant some flowers and try to add a thing or two to make your front yard look inviting. If your yard is looking rather dead, ask a landscaper for some help. Places to sit – How will you enjoy a nice summer evening outside if you don’t have anywhere to sit? Chairs are a must for any patio, and a table can be a good way to anchor a conversation in some nice weather. Check here for some ideas about how to make your patio company-worthy.